Most would agree that flowers play an important and colorful role in making the world around us a more beautiful place. To close observers, however, flowers also play a key “canary in the coal mine” role: The timing of their blooms informs us of the ecological health of the planet and, specifically, about the growing intensity of global climate change. While much botanical research doesn’t make the news beyond scientific journals, the seasonal timing of plant growth and flowering has been the focus of intensifying research interest among plant ecologists, climate change biologists, conservation biologists, climate scientists and citizen scientists. Accordingly, there is now widespread public awareness that our warming climate has been causing hundreds of plant species to flower earlier and earlier each spring. To facilitate this interdisciplinary research and to promote STEM education and public awareness, two prominent UC Santa Barbara researchers, Susan Mazer  and Katja Seltmann, have teamed up to digitize the university’s extensive herbarium, making both specimen photographs and metadata accessible by other botanists, agroecologists, conservation biologists, plant taxonomists, land managers, wildlife biologists and the general public. And they’ve received significant funding to do it. The National Science Foundation has awarded $225,000 to Mazer and Seltmann to provide open online access to high-resolution images of herbarium specimens and the timing of their flowering. The UCSB effort is part of a California-wide collaboration — total NSF funding for the project is $1.8 million — to provide online images and ecological data from 22 of the state’s public and private herbaria. 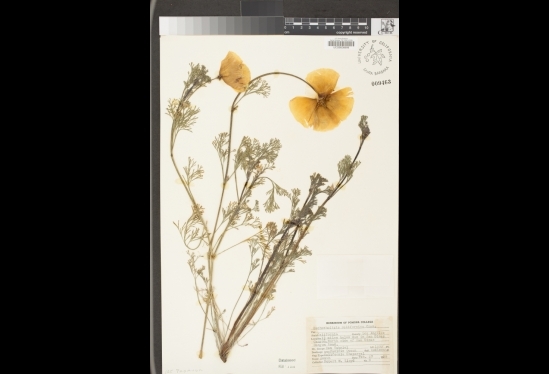 When complete, the endeavor, dubbed “Capturing California’s Flowers ,” will see the digitization of more than 900,000 plant specimens, all of which will be available for online viewing and study. “Think of herbaria as libraries — libraries holding some of the most valuable information available on the plant world,” said Seltmann, director of the Cheadle Center for Biodiversity and Ecological Restoration , home of UCSB’s herbarium, where plants that have been collected from the wild are dried, mounted and labeled for long-term study and reference. First established on campus in 1945 by university botanist Cornelius H. Muller, it now contains some 90,000 flower specimens collected from across Santa Barbara County and beyond. According to Mazer, a professor of ecology and evolution, a key objective of the digital effort is to better understand the influence of climatic variation — and past climate change — on the seasonal flowering times of wild plant species. By understanding the quantitative relationship between historical climatic conditions and the flowering times of wild species, she said, researchers will be able to offer predictions concerning the effects of upcoming climate change on the seasonal cycles of wild plant species. The digitized data will also facilitate investigation into the impact of urbanization and invasive species encroachment on species diversity across the state. Mazer noted that the project will enable new research into the effects of climate on the natural food chain. Thousands of wild pollinator, bird and mammal species depend on native flowering plants for pollen, nectar, fruits and seeds. “The flowering time of California native plants in part determines the abundance and availability of these food sources,” Mazer said. Many of the plants in the project are also rare and endemic species found in only small geographic areas — and California is a hotspot for plant specialization, the researchers explained. In addition to designing and implementing a new collaboration among participating herbaria, the project has partnered with the California Botanical Society  (Mazer is the current president) to expand the society’s Botany Ambassador Program, which connects graduate students to local schools and botanical gardens to offer lessons designed to inform students about botanical research and potential careers in the plant sciences.